Heel Pain on the Inside of the Foot? Warm weather brings a spike in patients complaining of medial heel pain from plantar fasciitis. As sure as the seasons change, so too does this aggravating condition that makes every step hurt. 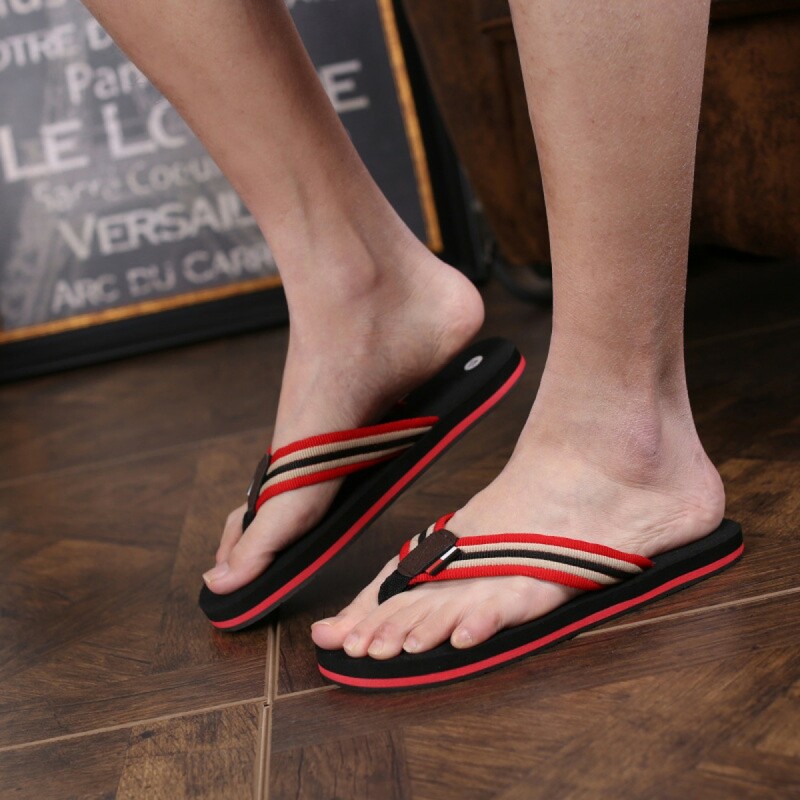 The increased use of flip-flops and sandals leads to the spike in heel pain and it makes those hot summer days painful and limits your ability to fully enjoy the summer weather. So what’s the problem and what can you do about it? The plantar fascia is a band of tissue that acts as a “truss” between your heel and toes. It’s not a muscle really, but more of an elastic ligamentous spring. Some people get this pain from either high arches or flat feet, but summer months lead to an increase in heel pain because when people wear sandals and flip-flops, the heel isn’t stable. When the heel isn’t stable, that plantar fascia tugs on the inside of the heel, almost like a child continuously pulling on your shirt for attention. 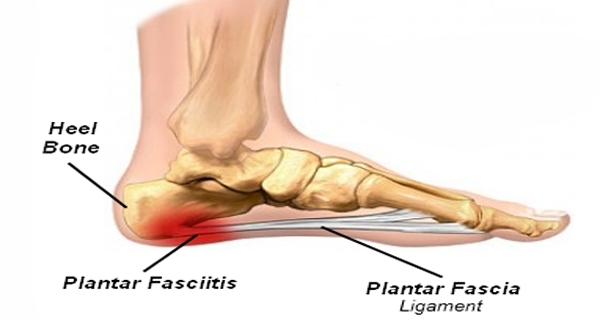 Over time with each step, the plantar fascia gets inflamed and leads to the heel pain. Couple that with a mix of other causes of heel pain, like being overweight, wearing high heels, and having poor running mechanics – you have yourself a painful day! Well, there’s a few things you can do. First of all, consider wearing a supportive shoe with the heel covered when you’re not at the beach or out to dinner. Sure, we get it – it’s summer, you want to wear sandals and show off your new pedicure. That’s great, but chronic sandal or flip-flop use causes that heel to roll around unchecked and over time, causes some inflammation. So maybe if you’re making a few errands, wear gym shoes instead. Just at the office sitting at your desk but have a big meeting later in the day? Cool, take those heels off, put “regular” shoes on, and put the heels or sandals on later. So what to do about it if you’re still having pain even if you took our advice? Well, here’s three quick “home remedies to try. Self-massage and stretch the plantar fascia. 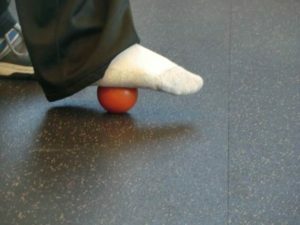 Take a lacrosse ball and roll it back and forth along the bottom of your foot. It will loosen up that tissue a little and may help reduce the tension and lessen your pain. 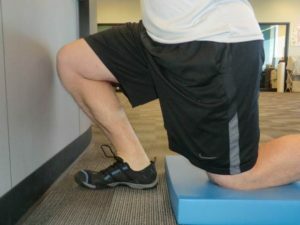 You could also try a plantar fascia stretch pictured below. Stand up straight and put your toes against the wall and lean in for stretch. You should feel this on the bottom of your foot. Stretch your ankle. Without getting too technical, if you have tight calves or a stiff ankle, that will cause that heel to collapse and increase the tension on your plantar fascia. The limitation in ankle dorsiflexion is an often missed contributing factor. See the picture below. 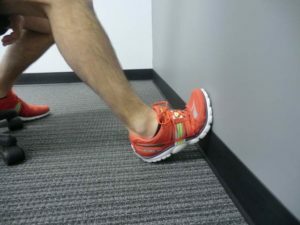 Put your big toe about an inch from the wall and move your knee towards the wall without letting your heel come off the ground. Move back about an inch at a time until you feel stretch and/or until the heel wants to come off the ground. Don’t cheat by moving your hips or anything – take what your ankle gives you. When you get that stretch, hold for 30 seconds and repeat as needed. For what it’s worth, “normal” is about 4 inches from the wall. Did you achieve that? Strengthen your arch. While there are lots of ways to do this, “towel curls” pictured below are great and easy to do. Lay a towel on the floor, and if needed, put a small weight at the end. Then just “curl” the towel up with your toes, then spread back out and repeat. Do this while you’re watching TV or reading your book at night to wind down. Without strong muscles to support the arch, it will collapse more and make that fascia more irritable. If you’re still having heel pain, we see it a lot around here and you can be confident we’ll get you in and out of here fast with great results. Give us a call! It would be a privilege to serve you.